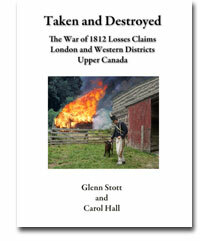 Taken and Destroyed is a key resource to help researchers identify which individuals made claims for losses due to actions during the War of 1812, where they resided, what items and property those claims were for, if the claim was denied or approved, and for how much currency. This book provides key information about each claim, and guides readers to the exact microfilm which contains the complete details and images of documents for each claim. Accessing the referenced microfilms will provide researchers with related images of any formal letters, diagrams, maps, notes and vouchers that appear on those microfilms.